While catering is great way to augment restaurant sales, it also presents its own unique set of challenges. At Online Orders Now we understand those special needs and have built a custom platform to help you deliver high quality fresh meals as efficiently as possible. 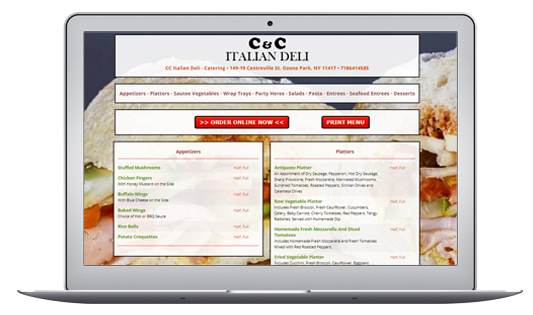 Our online menu ordering functionality is specifically designed for customers searching for catering services. Whether it’s a large party, wedding or even a medical sales rep that just wants to make a good impression, our specialized catering software will help you get the order right every time. Specialized Menu: In addition to your regular restaurant menu, we provide a separate catering menu with its own items, pricing and quantities. Advanced Ordering: It’s Monday morning and the big presentation is set for Friday afternoon. Your customer wants to make sure everything is setup for their big day. Thanks to Online Orders Now, they can place their order in advance because your catering menu is available 24 hrs a day. Catering Delivery Areas: You can also setup a completely different delivery area to either expand your normal delivery radius or reduce it to keep catering orders a little closer to your home base. Call us today at 813-549-7010 to speak with one of our sales associates to talk to them about your restaurants catering order needs. You can also use the contact form by clicking the button below.